Earth & Space Science Color By Numbers or Quizzes - GROWING BUNDLE! Science Color By Number or Quizzes - GROWING BUNDLE! 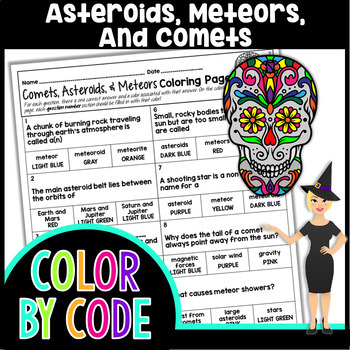 This Asteroids, Meteors, & Comets Science Color by Number includes 10 questions covering the physical differences between these celestial bodies, their movement, classification, and interaction with earth's atmosphere. With what standard does this resource align? This resource will aid students in moving towards mastery of NGSS MS-ESS1-2, NGSS MS-ESS1-3, Tennessee 5.ESS1.3. These color by numbers are no prep! 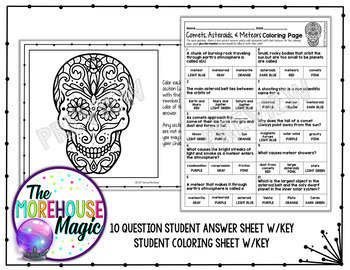 Print the answer sheet on one side and the coloring on the other or print both on one side to save ink and copier counts. How do I use color by numbers? • Use the answer sheet as quiz! Want even more Color By Numbers?